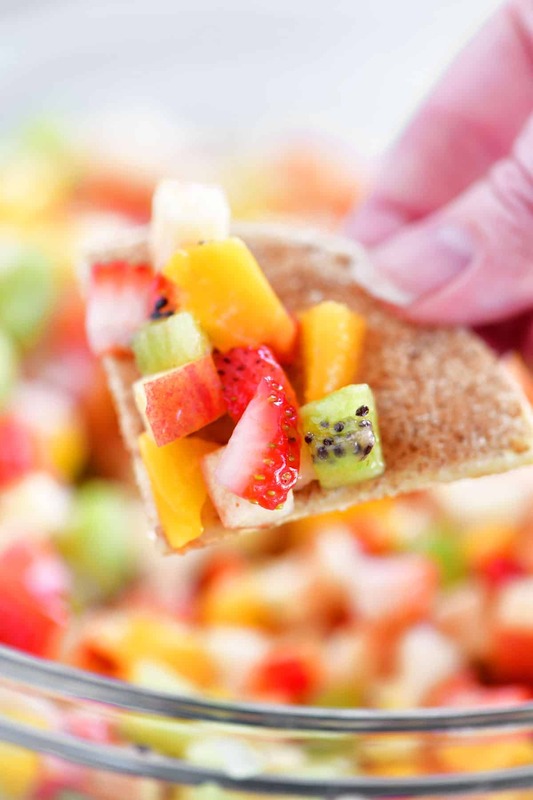 Fruit Salsa with Cinnamon Chips is a healthy appetizer that everyone loves! 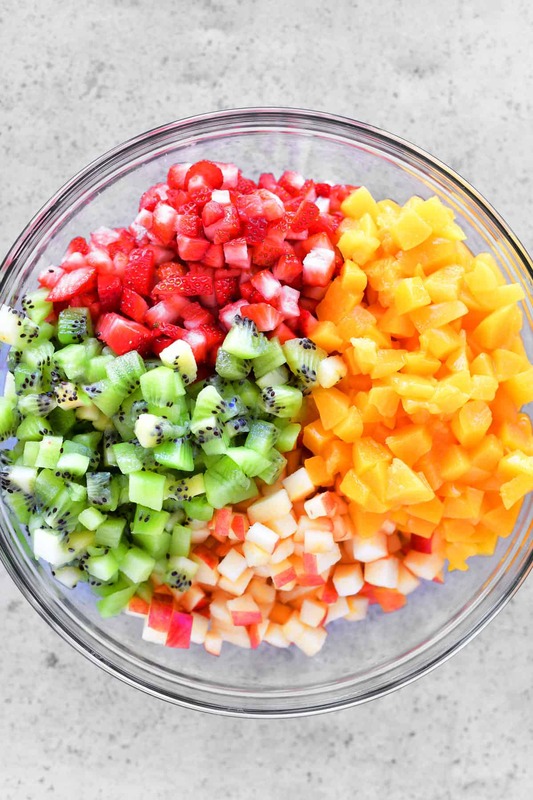 This fruit salad is super easy to make and is perfect for so many occasions. I’ve been making fruit salsa for years and have several kinds of fruit salsa recipes on my blog from pineapple salsa to watermelon salsa. 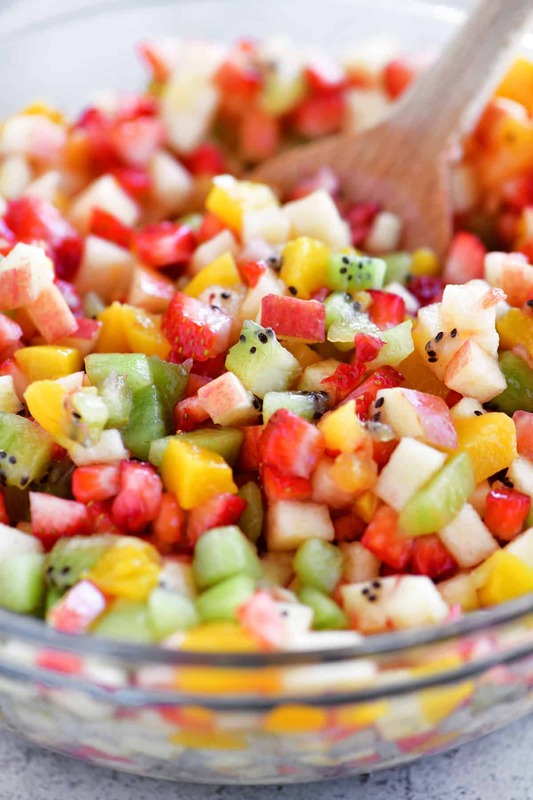 But it all started with this fruit salsa recipe that I think heard about at weight watchers. The original recipe said to add sugar and cinnamon but I never had since fruit is sweet enough already. This is a great recipe to make when you want to bring a healthy appetizer to a party or for when you feel like snacking but are on a diet. For some reason, eating the fruit all cut up and mixed together makes it more fun! Where is the fruit salsa recipe? In this post, I will share step-by-step instructions with photos for how to make the fruit salsa and cinnamon chips, as well as answering FAQs about the recipe and sharing a short video showing the recipe in motion. But you can go directly to the recipes by scrolling down to the bottom of the post. Start by dicing a couple of apples. 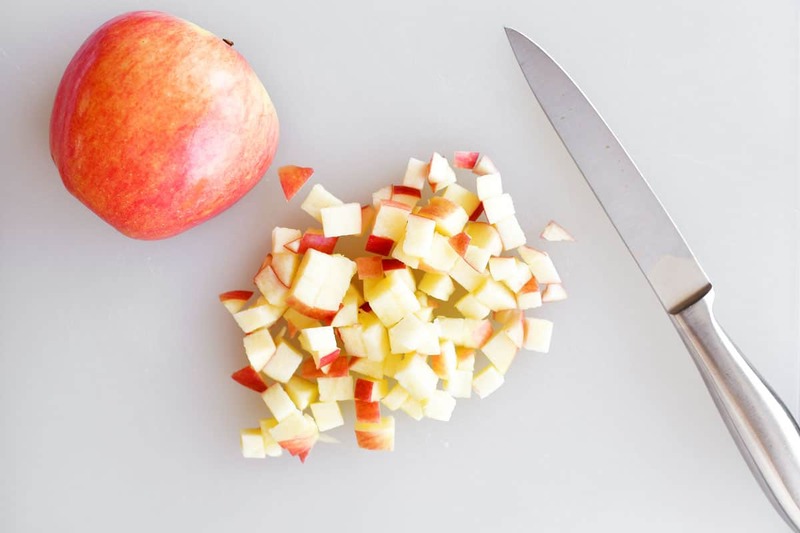 Cut the apples into slices and then cut the slices into small pieces. Put all of the diced apples in a bowl. I never worry about making them all the same size. They are going to be mixed in with the other fruits in a bowl. Just make sure the pieces are small enough to be scooped onto a chip. Next, dice the strawberries and add them to the apples in the bowl. If you can find fresh strawberries, they are the best way to go. If they aren’t available you can thaw frozen strawberries and slice them instead. Wondering how to quickly dice strawberries? While dicing a whole pint of strawberries, I discovered a little trick that made it quicker. 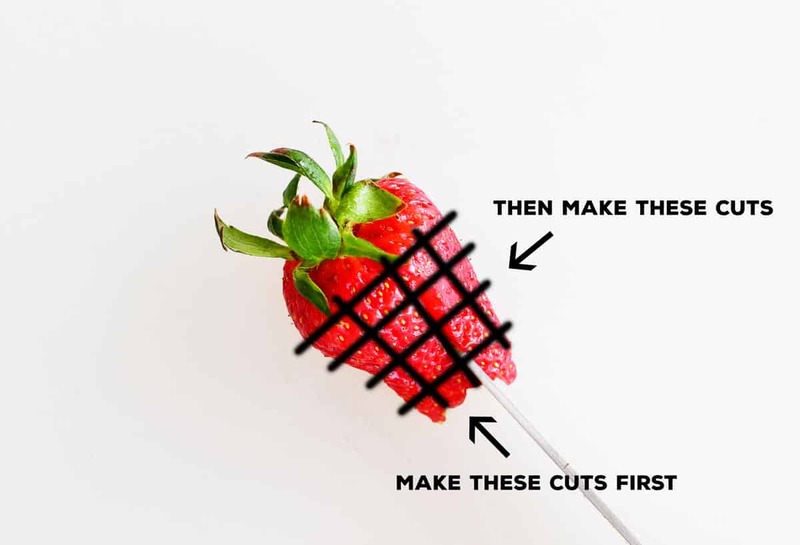 Make cuts along the length of the strawberry without cutting into the top part where the stem is (this will help hold the strawberry together while cutting). Turn the strawberry and make more cuts along the length on the other side. 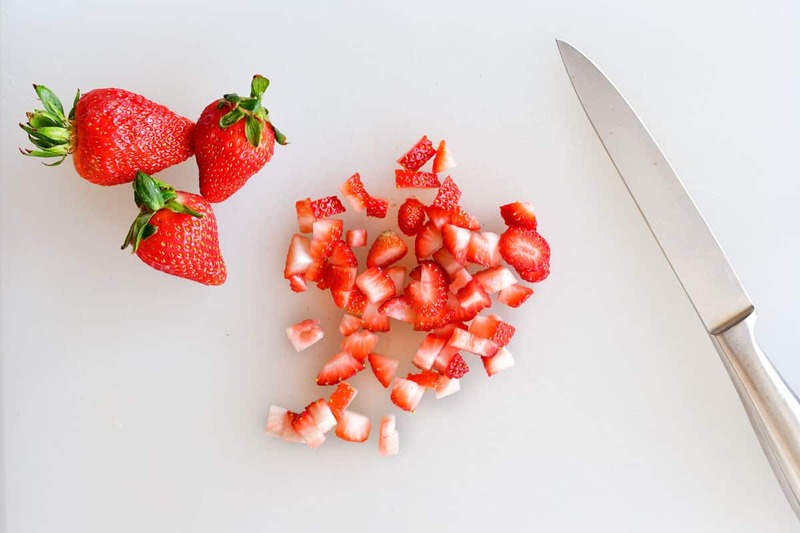 Finally, make the cuts across the width of the strawberry and all of the diced strawberry pieces will fall off the strawberry stem as you cut. For the peaches, I usually choose no sugar added canned yellow cling peaches since they are always available and ripe. But if it is peach season and you can get your hands on some fresh, juicy peaches, go for it! 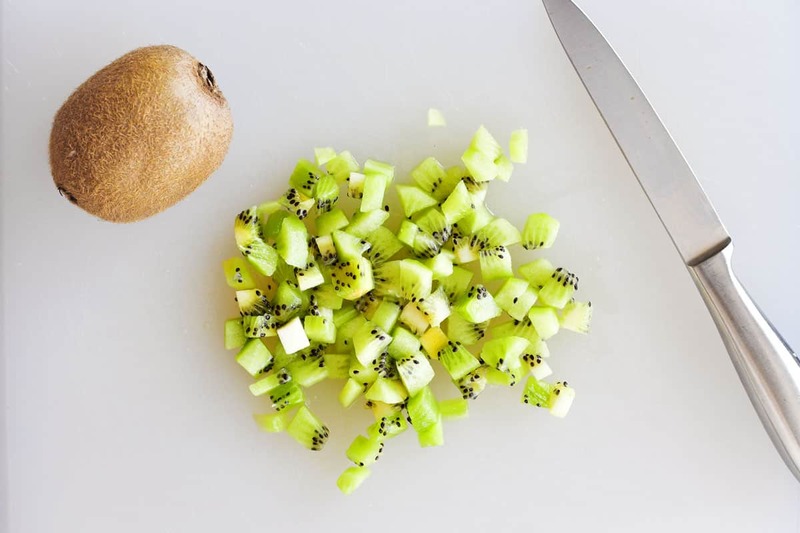 Next, peel and dice the kiwi. Add them to the bowl. 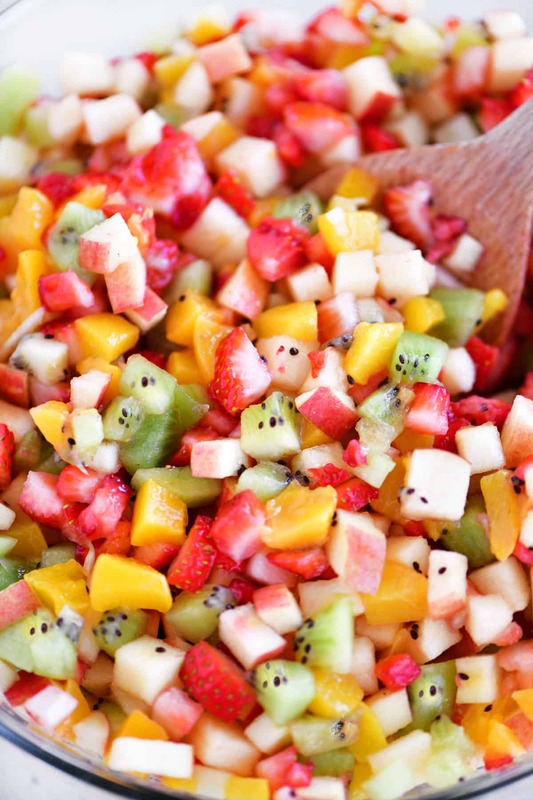 Once you’ve got all of your diced fruit in a bowl just give it a stir and it is ready to eat. 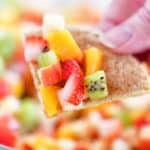 Cinnamon chips are delicious with fruit salsa and are super easy to make! For this recipe, I used mini flour tortillas but any size will work. Spray the flour tortilla with cooking spray and then sprinkle it with cinnamon sugar. Then, bake at 350˚F for 7-9 minutes. 1. What kind of apples should I use to make fruit salsa? I prefer using sweet apples that don’t brown easily such as like ambrosia apples but any apples will work! 2. What other fruits can I add? You can add whatever fruits you want. 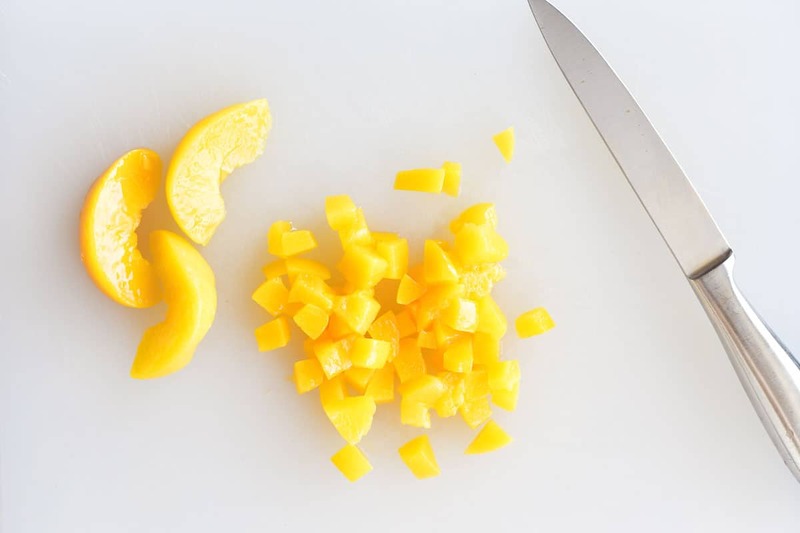 Try adding diced pineapple, blueberries, diced pears, and diced mangos. 3. Can I add cinnamon sugar to the fruit salsa? Yes, you can sprinkle the fruit salsa with cinnamon sugar and stir to combine. 4. How far in advance can I make it? I would suggest making it the same say you plan to serve it. 5. Would it work to add some veggies to this fruit salsa? Yes, you can add veggies to make it more of a traditional salsa. 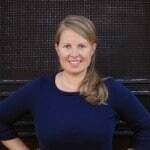 Check out my pineapple salsa recipe for additional ingredient ideas. Watermelon Salsa: This watermelon salsa recipe is so fun when served from a watermelon bowl! It is delicious with chips or on top of grilled chicken, salmon, or tacos. Pineapple Salsa: This pineapple salsa recipe has a delicious combination of sweet and spicy. It can be served with grilled chicken or fish or as an appetizer with chips. Apple Mango Salsa: This Apple Mango Salsa recipe is the perfect salsa to eat with chicken, fish, and tacos but it can also be served as an appetizer with tortilla chips. Pomegranate Fruit Salsa: This Pomegranate Fruit Salsa recipe is fun to serve from pomegranate bowl at holiday parties! The diced fruit is perfect with crispy baked cinnamon chips. Dice the apples, strawberries, peaches and kiwi. Mix together in a bowl. Refrigerate until ready to serve. Mix together the granulated sugar and ground cinnamon. Spray the flour tortillas with cooking spray. 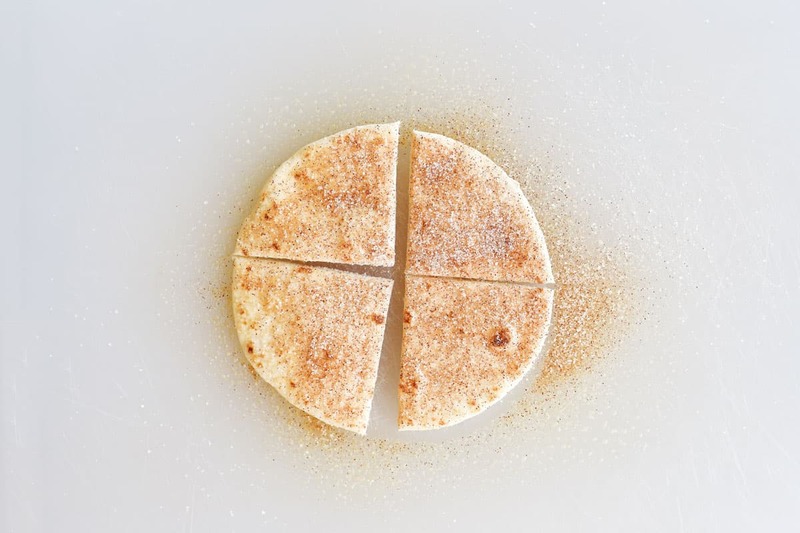 Sprinkle with cinnamon sugar and cut into triangles. Place on a baking sheet. Bake at 350˚F for 7-9 minutes. Serve the cinnamon chips with the fruit salsa.